We’re on a winning streak with #clientmarinatudor and a kitchen remodel is up next. It’s a good thing since we love working with this client so much, we hope the projects will never end. We started upstairs with the master and children’s bedroom and bathroom, and now we’re continuing downstairs with their kitchen. This client is classic and modern but casual in spirit and it’s fun working with them because they trust our taste and are willing to push the envelope a bit with color and texture. Their existing kitchen is functional, but outdated—think wood front cabinets, speckled granite countertops, lots of nooks and crannies that don’t optimize space, soffits that make ceiling feel low and not enough natural light. In addition to needing more countertop space, they’re also looking to improve the flow of the first floor and connecting the kitchen with the entertaining areas and newly redone backyard. We are using the location just blocks from the beach as a source of inspiration with a muted color palette of soft grey and whites. 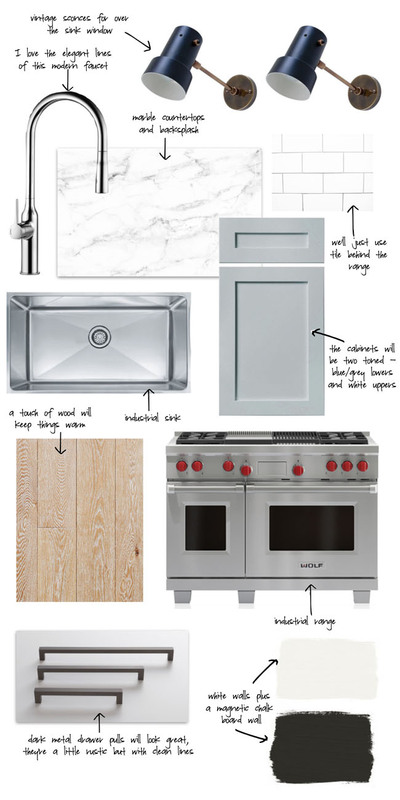 We are using marble for countertops and backsplash except behind the range where ceramic tile will be more durable. The cabinetry will be two-toned, with a blue-grey color for the lowers and white for the uppers. Vintage black sconces above the sink, dark metal cabinet pulls and a magnetic chalkboard wall are some of the touches that will make this space unique.